Suid-Afrikaanse Lugdiens (SAL) flight bookings may be discounted with exclusive SouthAfrica.TO travel vouchers. Simply email a writeup of any flight to cheapflights@southafrica.to and we'll send you vouchers (tip: send photos for more vouchers). Prior to South African Airways' rebranding in 1997, our flag carrier was known by its Afrikaans name Die Suid-Afrikaanse Lugdiens (SAL). SAL was synonymous with a trust-worthy airline that offered direct flights from South Africa to destinations across the world along with friendly service. Although no longer officially used by the airline, many South Africans still use SAL to refer to the airline that they know and love. If you'd like to read about our flag carrier in Afrikaans, you can head to our sister site RitsGids. Although SAL is now only the airline's Afrikaans name, it also hints to the South Africa's troubled past. Prior to 1990, the airline's operations were vastly influenced by international condemnation of apartheid. With no stop-overs in Africa possible, the airline had to largely resort to long-range aircraft. Increasing international sanctions also began to place pressure on the airlines international route network. In 1997, the airline rebranded itself and changed its official name from the Suid-Afrikaanse Lugdiens (SAL) to South African Airways (SAA). 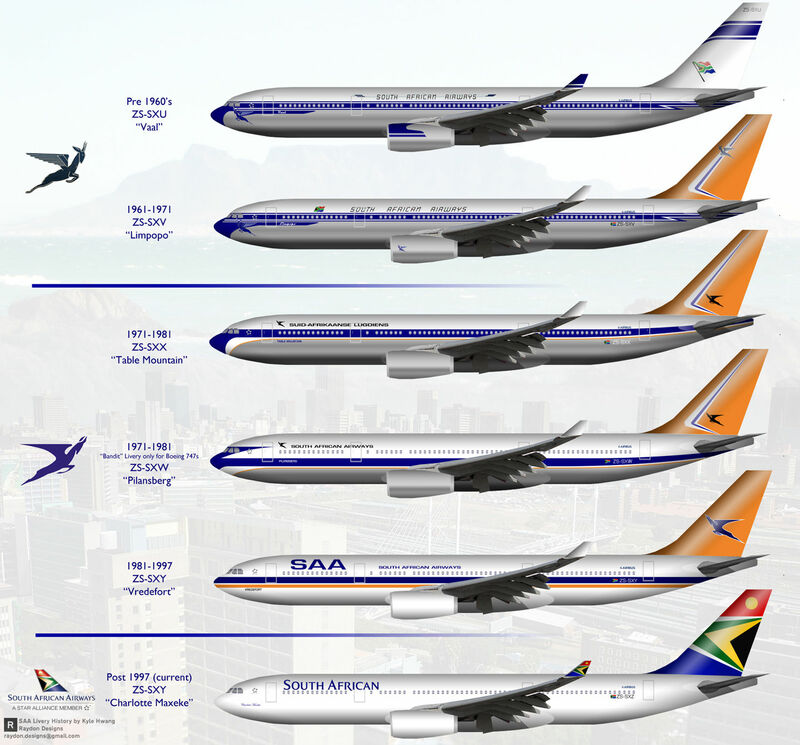 They also changed the aircraft livery, replacing the old flag colours with our beautiful new ones and changing the name on the aircraft to the more widely used "South African Airways". Based in OR Tambo International, our national carrier now offers hundreds of international, regional and domestic flight daily. And with 11 official languages, you can call them SAL, SAA or whatever you like! As a premium airline, your SAL airfare includes free checked luggage (restriction apply depending on travel class), free meals and drinks, online bookings and check-in on their FlySAA website, a Frequent Flyer program and both Economy and Business Class seats. As a member of the Star Alliance, SAL has partnered with some of the most well-known brands and airlines like Emirates, Etihad, Virgin Atlantic, Avis, Shangri-La Hotels and Resorts, SpecSavers and many more. SAL has also partnered with other local airlines like SA Express and Airlink, although it shares a special relationship with its subsidiary Mango Airlines. Most recently SAA had a partnership with Etihad Airlines, which came to an abrupt end less than a year after it started. SAL boasts a large fleet servicing its vast domestic, regional and international route network. The airline is heavily invested in Airbus with eight A319-100's, twelve A320-200's, six A330-200's, eight A340-300E's and nine A340-600's (the second largest fleet of these in the world!) SAL are in the middle of renegotiating a controversial Airbus deal, according to which they have already purchased and taken delivery of 10 A320's and are planning on leasing an additional 5 A330-300's instead of taking delivery of another 10 A320's. This will allow them to phase out the wide-body A340-600's. The airline is also in possession of seven Boeing 737-800's, two Boeing 737-300's and seven Boeing 737-800. Raydon Designs compiled this list of historical SAL liveries, with the small inclusion of the current SA flag. Most of us will recognise the second-to-last aircraft as it was used until fairly recently. In 1986 SAA employees founded the South African Airways Museum at Rand Airport. The museum houses SAL memorabilia such as aircraft models and photos along with more impressive decommissioned aircraft. The museum currently houses two Boeing 747s and a Lockheed Lodestar, a de Havilland Dove, a Lockheed Starliner and a Douglas C-54.